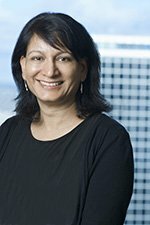 Home Our Team Poonam P Tauh, Ph.D.
Poonam Tauh’s practice focuses on the drafting and prosecution of pharmaceutical, chemical, biochemical, petrochemical, and polymer patent applications in Canada and around the world. Her range of patent expertise extends to oil & gas, clean technology, cosmetics, personal care, pet care and consumer household products. Poonam also has expertise in the Patented Medicines (Notice of Compliance) Regulations, particularly on issues relating to timing, information and drug submission requirements for listing a patent on the Patent Register. Poonam also has extensive experience in prosecuting industrial design applications, and applications relating to plant breeders' rights. Poonam works closely with clients and corresponds regularly with a broad network of foreign associates to coordinate the worldwide management and strategic positioning of clients’ international patent portfolios. She is also involved in the preparation of legal opinions relating to validity, infringement, patentability and freedom-to-practice. Poonam also has extensive experience in prosecuting industrial design applications. Poonam has a broad research background including practical experience in synthetic organic, polymer, analytical and organometallic chemistry. Poonam’s doctoral research related to the investigation of anti-cancer therapies, with a focus on the synthesis of building blocks for target drugs such as Taxol. She has also worked on the synthesis of drug analogs, as well as developed new reaction techniques useful in synthetic organic and polymer chemistry. Poonam has several publications related to her research in organic chemistry in such journals as the Journal of Organic Chemistry, and has presented her research at domestic and international conferences. Poonam is a Registered Canadian Patent Agent and also has limited recognition to represent Canadians in patent matters before the USPTO.